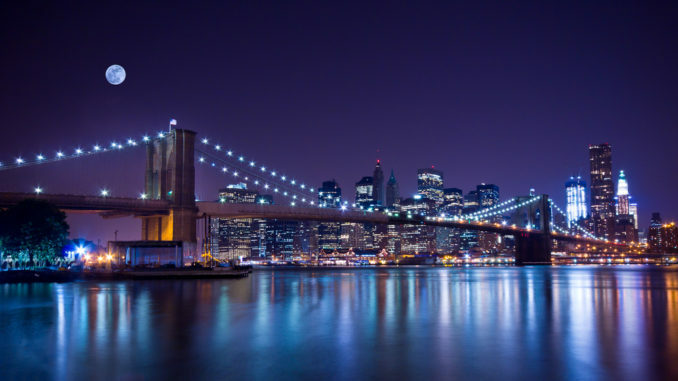 The Brooklyn Bridge is more than just a point of access or a travel solution; it’s a living, breathing piece of New York City history, and it’s beautiful to look at. It’s impossible to imagine it now without the six lanes of traffic and cars running across it, but when the bridge was completed there were no cars at all. The first people to cross the bridge did so on foot in 1883, at a toll of only a penny each. These days there’s not only all the cars, but often thousands of people walking across at any one time. You needn’t have any concern about its ability to cope with weight though; the famous circus of P.T. Barnum and all his elephants once walked it with no problems. The bridge represents one of the greatest engineering accomplishments of the 19th century. Covering a distance of over a mile, it was the largest suspension bridge in the world on the day it opened; and played host to another set of world records, too. For a time, the Gothic limestone towers were the tallest anywhere in the Western world. Designer John Roebling thought and built big. To those who live in New York City it’s easy to just accept it as part of everyday life, but we invite you to look at it again with fresh eyes. This bridge is a monument to a bygone age, and there’s a reason it’s been the inspiration of art, music and poetry for well over a century.